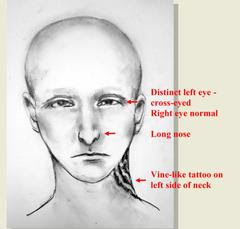 Male Hispanic, in his mid-20's, 5'6", 140-150 lbs., with a shaved head, a long nose, and a distinct crossed left eye. The suspect also had what appears to be a tattoo on the left side of his neck resembling "growing plant vines." The suspect was wearing a light colored t-shirt and dark colored shorts. The suspect rode a silver or metal color BMX style bicycle. The victim was able to complete a composite sketch of the suspect and the Arcadia Police Department is interested in hearing from anyone who recognizes a person matching the composite sketch. The case is under investigation. Anyone with information on this incident is encouraged to contact the Arcadia Police Department at 574-5151, case number 18-4073. If you prefer to provide information anonymously, you may call "Crime Stoppers" by dialing (800) 222-TIPS (8477), use your smartphone by downloading the "P3 Tips" Mobile APP on Google Play or the Apple App Store, or by using the website http://lacrimestoppers.org.